2 in stock. Next Day Dispatch. Bauhaus-trained Carl Auböck II is an influential figure of Austrian modernism and his original metal workshop in Vienna still houses the family business today. 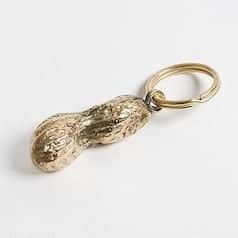 The company’s portfolio of hand-made pieces includes this playful peanut-shaped key ring, made of polished brass. Now into the fourth generation, Carl Auböck VI continues to produce these wonderful items for a new century.